One last detour on my journey through past Proust posts, to a novel whose title reveals its relevance. 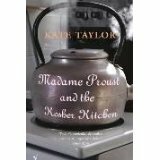 Madame Proust and the Kosher Kitchen (2003), Kate Taylor, 457 pp. This novel, set in three time periods, is about women and how they cope with frustrated love, parenting, artistic creation, and, most importantly, anti-semitism — echoing Proust’s themes, but from the viewpoint of, say, Gilberte or Marcel’s mother. Marie Prevost, the main character, is a Canadian translator reading through Madame Proust’s journals and suffering from unrequited love — the object of her desire is Max, son of Sarah, daughter of parents killed at Auschwitz (and also distantly related to Mme Proust). 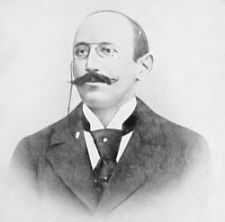 Through Marie, we learn about Mme Proust, who worries about the bohemian life of her odd son, Marcel, at a time when all of France is arguing the case of Dreyfus. It is also through Marie that we learn about Sarah, sent from Paris to foster parents in Canada, saving her from the death camps but causing an anomie no one seems able to break through. The parallels in the three stories are ingenious (causing comparison to Michael Cunningham’s The Hours), some you might guess right away and others only as they carefully unfold in the plot. In the Jewish neighborhoods of mid-20th-century Toronto, reeling from WWII and the horrors of the concentration camps, we find Sarah, unable to connect to anyone, for decades suffering the shock of the separation from her parents. The modern setting gives us Marie’s life in Toronto and her journey to Paris, where she has to confront her own disappointments. It’s as though Taylor is allowing us to put together a jigsaw puzzle, handing us just a few pieces at a time. At first, none of the pieces fit, but eventually patterns emerge, and at the end we have a detailed picture of lives that feed into each other. Some might argue that the links are too neat, too coincidental — but this is the author’s prerogative. Life often is coincidental, dependent on the daily accidents of crossed paths and shared desires. This novel is a beautiful homage to Proust’s epic, to love and memory, to desire and loss. 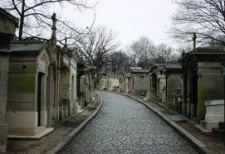 It begins and ends at Père Lachaise Cemetery in Paris, a must-see for any fan of literature visiting Paris. (In The Innocents Abroad, Mark Twain calls it “the honored resting-place of some of [France’s] greatest and best children.”) You’ll want to go there after reading this book. If you do, take a few pebbles to place on the graves you visit. 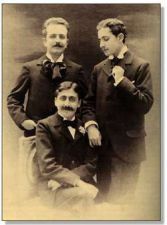 This entry was posted in 2016 Goals and tagged Kate Taylor, Marcel Proust. Bookmark the permalink.